Home > Lasers > ASG Universal Pistol Laser. 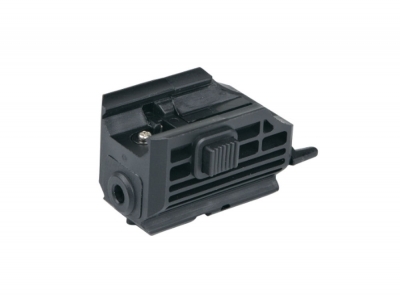 Compact rail mounted laser for all Airsoft guns. Will fit on all standard rails including any AEG with a weaver/picatinny system. 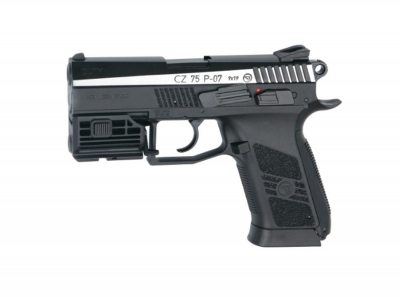 The compact design will fit on pistols like the CZ75 series and STI Duty one. Rugged lightweight construction, slides on easily, and stays tightly locked on with the aid of a retention spring. The laser is fully adjustable for windage and elevation and features an ambidextrous on/off switch that can be activated by either the shooting or non-shooting hand. Rail at bottom of laser allows mounting of additional equipment like a tactical light. Class II laser, <1mw 635-650 nm. Uses 3xLR44 batteries not included. Lasers help new shooters learn sight picture, and trigger control much more quickly. Lasers allow accurate shooting from behind cover and concealment. Laser can be used to silently signal teammates, and to point out hidden enemies.